In this post I will show, how you can interact with a google map embedded in a TWebbrowser component in order to get the location ( latitude and longitude) of a point when you click in the map. 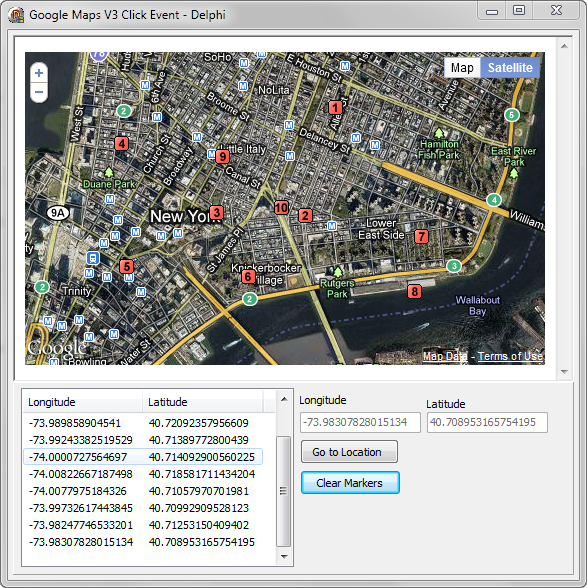 To get the location of the mouse when you make a click in the map you must add a Google maps Event Listener, passing a function to process the event, the values of the current location are retrieved in the event.latLng variable , the next step is store the values returned in a hidden field element to after get these values from Delphi. Now from the Delphi side, you must detect the click event in the TWebBrowser component and then read the values stored in the hidden fields. Exists several ways to detect the click in the TWebBrowser, in this case I will use the OnCommandStateChange event. Check this code which detect the click event and then read the values stored in the hidden fields. 082 ‘ PutMarker(Lat, Lang, Lat+”,”+Lang);’+ //<-??? Is this a mistake? This code creates a new marker on the old one when the button "Go to Location" is pressed. Or is it about you wanted? I've translated your demo with my framework (http://www.delphipraxis.net/1108245-post90.html). Additionally show the TEdit components "Latitude" and "Longitude" the current cursor position. Thomas you are right, the call to the function PutMarker inside of the GotoLatLng must be removed. Sorry for the strange posting but I can’t for some reason download any of your Google Map examples on the Delphi Praxis site even after creating an account. Every time I click one of the demo zip files the site refuses to let me download. I can’t seem to find your contact email so I decided to see if this will work. if you have problems with a download, you can send me a email to tngab(at)t-online(dot)de. Got a question on the direction function from another script u do. But that don’t work … any solutions ??? I also tried to get some values from the javacsript, but i don’t know how to get them in a delphi variable. Is there anyway of putting a listener on the maps ‘mousemove’ event and then picking up the values of the lat/long and displaying them in an edit box so as the user moves the pointer the values are continually updated? In a similar way could you detect a click on a marker in the map by adding a listener? Firstly thanks to all of u for ur help, i managed to do all i wanted under GoogleMap. All, not really, just need a last help from u : i need to make a Delphi TEdit text that would show the autocomplete options from Google Maps. Means when i’ll get values in my TEdit, i’ll have an auto-completion from Google Maps which will give me all near’name values. Hope u’ll understand my waitings. Gwenael, add more details to your question. The framework is in the first post (http://www.delphipraxis.net/157004-google-maps-ueber-com-component-object-model.html): GoogleMaps_1.1_Source&Demos.zip. There are all necessary files include (BrowserTools, HTMLObjects, gmXXX… and gmConfig.inc). Thank you for the framework, very good job. mean you Rodrigo or me? If you mean my framework: Thank you and sorry for the late reply! But here is Rodrigo’s blog and I don’t read it every day. If there are questions about the framework, it is better to put them in the forum Delphi-Praxis (http://www.delphipraxis.net). This forum is in German, but you can also write in English. At the moment I have unfortunately no time for a own homepage and therefore I host the project in this forum. To your question: Marker.Map:=nil remove a marker from map. The weather-demo (http://www.delphipraxis.net/1119316-post108.html) demonstrated the deletion of markers (Button Clear). Thank you for the very informative code! But the problem with the above is that there is no IPersistStreamInit interface in Lazarus. Does anyone know a workaround to this? The IPersistStreamInit interface is declarated in the ActiveX unit in delphi, but it seems which not is included in Lazarus, so you must declare yourself using the MSDN documentation. Thanks for the quick reply, I’ll try to look it up! I have tried to combine the two examples (I and III) in this excellent contribution of code. How do I get the coordinates (lat, lng) of the marker and put it into my Delphiprogram? How to add a KML file to the Google Maps API V3 from Delphi project? I want to view an existing multi-polygon KML file as an overlay on the Google maps (in a desktop Delphi app). I downloaded the project/app and tried to a) run application/exe (it would not go into full execution) and b) tried to compile using Delphi XE2. It got an error in compile; I contacted the developer. I will share good results that I might get with this exchange. In the meantime, perhaps there is another known demo app showing how to view KML files with Google Maps?